There were bronze plaques on the walls here once. Two of them. One to explain the historical significance of this ruined building, and one to mark the life of an archaeologist who died here, on 22 July 1970. I was too young, in 1970, to recognise this tragedy. 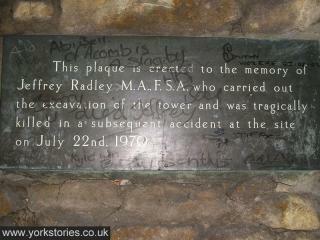 So were the teenagers who later scrawled all over the commemorative plaque. Pictured here in 2004, before it disappeared. This photo is one of those images from my local wanders which has no artistic merit but which could prompt a whole page of analysis, or at the very least, questions. Like why a group of people – girls, apparently – would write on a commemorative plaque. Whether all surfaces are equal if you want to label another girl as a ’slag’. Whether the lack of respect is due to not having lived long enough to know what death means. And what the relatives and friends of Jeffrey Radley would feel, seeing this. That last question makes me feel a bit uncomfortable about including this photo, as it did at the time I took it. Closer inspection shows that amongst the scrawl there has been added ’sorry u died Jeffrey’. So a moment of recognition then, and a message written in a rather endearing way, directly to Jeffrey – after they’d written their teenage scribblings all over his plaque. They’ll be grown up now, and may now know what death means, and may perhaps have been to lay flowers in a specific and important place, precious to them, which they’d want other people to respect. I’ve taken thousands of photos of York since this one, but this is the most thought-provoking, still. Here in the layers of earth and stone Jeffrey Radley died when the structures supporting the excavation gave way. On 22 July 1970, 42 years ago today, the local press reported the cave-in and that he was feared buried. The Yorkshire Evening Press, in April of that year, had reported that a scheme for the opening out and permanent exhibition of the Anglian Tower had been approved. 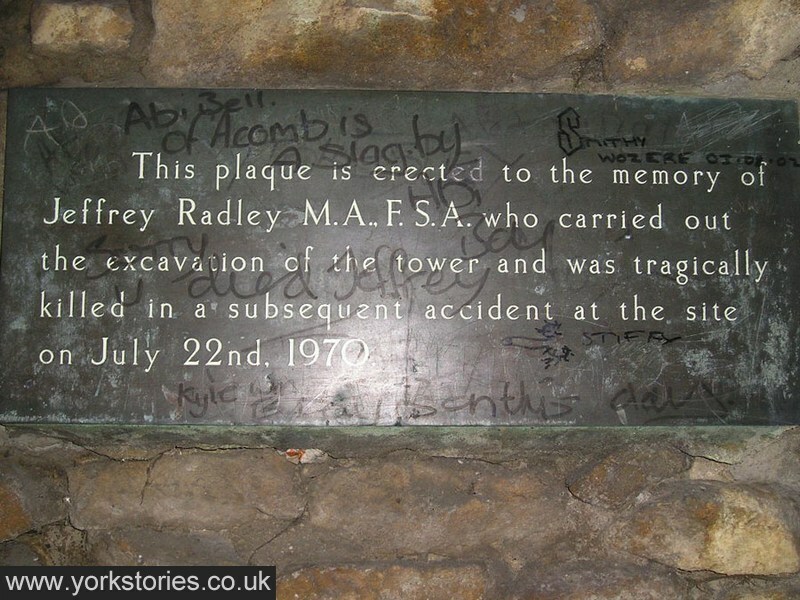 The plaque commemorating Jeffrey Radley’s work here was unveiled in 1971. It seems to have disappeared sometime in the last couple of years. As have several other valuable bronze plaques placed by York Civic Trust in other city centre locations. Jeffrey Radley also wrote poetry, my online research revealed. I hoped that the library building overlooking the place where he died would have copies of his poetry, but it doesn’t seem to, so sadly I can’t end this page with any of his work. Perhaps someone out there can assist. I climbed up the banks nearby recently, and looked down on this area, and saw the excavated layers from a new angle, and lined them up, framed in photographs. It was only later, looking at them again on another screen, back at home, that I remembered that I’d meant to mention the Anglian Tower again – its sealed-up state, and that bronze plaque. So thought I’d do that today, 42 years to the day since Jeffrey Radley died here, in recognition of his work in opening it up. I can’t offer a bronze plaque, just a website page. I am fully aware that I’m writing this as someone who didn’t know Mr Radley, and that I’m only an observer, decades on, of our city’s more recent layers. Comments are welcome below, and on the associated pages on the Anglian Tower. I’d love to see this area opened up to the public, its a neglected corner of York, but, as i said in a previous post, with a tangible sense of history..
And it would be good to let others see the work of Jeffrey Radley, let him have a corner of York which is visited and appreciated. I’m not sure how to achieve this, or who to approach, but i think i may have a try..
It’s difficult, isn’t it, to know how much and in what way to open things up – as discussed on the 3rd page of these thoughts on the Anglian Tower. But something needs doing here, doesn’t it. I imagine there are already plans to improve the area, as it’s such an important site. Really appreciate your comment Andy. It’s nice to know your grandfather would have approved. I’ll try to find out if there are plans to replace the plaque, or at least to tidy/improve the area. My grandfather Leonard B. Cooper (a dedicated amateur archaeologist) was a friend of Mr Radley. He visited with him at the Anglican Tower days before the tragic accident, he urged his friend to shore up the trench. My grandparents would often take me and my sister by train to York for the day. We’d always go and visit Jeff’s memorial. My grandfather died many years ago and since when I visit York I always make a point of visiting the spot where is friend died. I’m saddened to hear that the plaque is no longer there! I’d like to thank you for your webpage I know my grandfather would have approved. We (FYW) should look into getting this plaque replaced. Maybe something in slate, at ground level, would be appropriate? Was admiring the rounded slate, with inscription, around the statue of John Betjeman at London St Pancras. I visited York just last weekend and made my little pilgrimage to the spot where my granddad’s friend had died. I was only months old when the tragedy occurred. As a child I visited the spot several time with my granddad when he would go to pay his respects. Somehow to go back there renews the memory of my granddad, he passed away back in 1984. I have added a link to my Photographic archive. Both Mr Radley and my granddad appear in the image of Glebe Low Cist. I hope that it is of interest. I took the photo at the Glebe Low stone cist.The capstone needed 3 to lift it! Really nice to see the photo Andy, thank you, and to hear you’ve been back to the Anglian Tower recently, since your earlier comment above. When I compiled this page I hoped someone out there would remember more about Jeffrey Radley and add a comment, and you have, and it’s much appreciated. Hi, Jeffrey Radley was born in 1936 in Aughton near Rotherham to a mining family. He was the first Radley to attend Grammar school and subsequently graduated with honours at Leeds University. Subsequently, he studied for a Masters at Berkeley, California where he spent time mapping the soils of Nicaragua. he developed a love of archaeology at an early age and dug, studied and write up all of his finds as he went. he was a prolific archaeologist in the Sheffield area, working at Sheffield Museum in the early 1960s. Most of his papers are now in the museum and there is a scholoarship in his name set up through a local archaeological group. He became a leading specialist in the Mesolithic period specialising in tumuli and arrowheads. He moved to lead archaeology in York and excavated the Anglian Tower for the roman celebrations that year. He was the first who believed that the tower may be Anglian attributing this to the Danish period. His tragic passing affected the city and changed the safety regulations for archaeologists since that time. I was interested to read (rather late) your thought-provoking piece, and have wondered what happened to the plaque. I have a picture somewhere of it before it was defaced. Jeff Radley was a university contemporary of my father in law, and a distant relative of an archaeologist colleague. It has been very interesting to find out a little more about him, and to see a picture of the man himself courtesy of Andy Robinson. I have only recently found this web link to the life of my father who I know was a leading archaeologist at the time and has always been my inspiration. I found this link as I was researching Anglo Saxon York for my eleven year old son (one of Jeff’s five grandchildren). As a family we have always treasured the Anglian Tower and appreciate the York stories links to my fathers prolific academic work that he produced in such a short lifetime. The site has often been neglected and I have always been aware of the graffiti and litter around the site. I have always felt that the comments on my father’s plaque mean that people are visiting the site and there is life in this tragic setting. Jeff was an expert on Yorkshire and Pennine Mesolithic archaeology and it is also befitting that there is a written memorial engraved on millstone in the Peak District. I am most touched be the comments. This page has always felt like one of the more important ones on this website, because of what the comments added to what I’d written, and with your comments added Ian it means even more. Thank you. I’ve emailed you on the address you provided as Mike Plant, who added a comment above, has been in touch with me and would like you to contact him. Hi Ian, I was really interested to read your comments, it completes a story. When I told my mother about this website she could recall meeting your father through his friendship with her dad (LB Cooper). At the time she said I’m sure Jeff hadn’t been married long and that there was a child, an infant at the time of his death and she wondered what had become of them. For me Jeff’s story had always been one of a life cut tragically short, but now it has become a story of continuity and new life.